Martin Braun was born 18 June 1838 in Baden. In 1865 he married his first wife, Maria Eva, born 1840 in Baden. The family settled in Chicago by 1868. By 1870 they were living at Walton St. and Greenview Ave. Maria Eva died 23 February 1872 and was buried in St. Boniface Cemetery in Chicago. On 10 September 1872, Martin married Willamina Krock. Martin died 19 February 1919 and Willamina died 27 March 1926. The are both buried in St. Boniface Cemetery. For further details, contact the Chicago Genealogical Society. 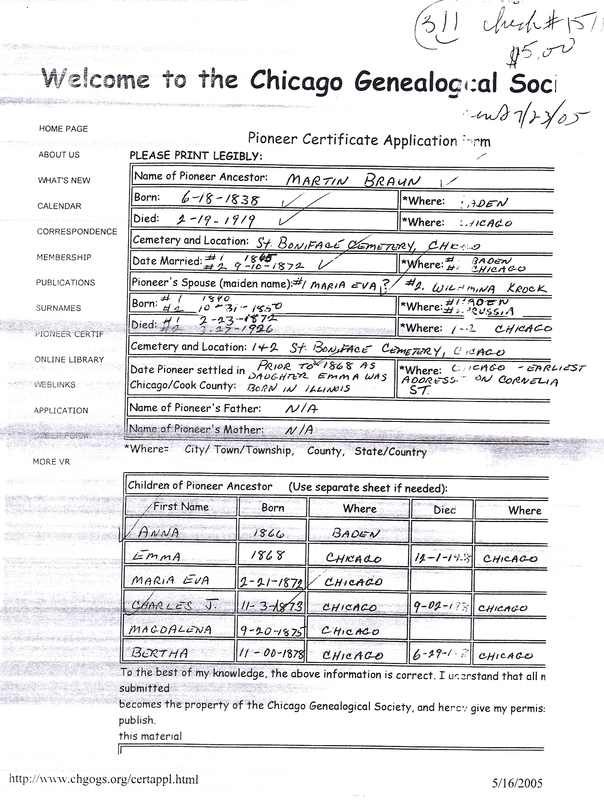 Martin Braun is Pioneer Ancestor number 311, 318 and 319.